Question 2. A solution reacts with crushed egg-shells to give a gas that turns lime-water milky. Question 4. Which one of the following types of medicines is used for treating indigestion? (a) dilute sulphuric acid reacts with zinc granules. (b) dilute hydrochloric acid reacts with magnesium ribbon. (c) dilute sulphuric acid reacts with aluminium powder. (d) dilute hydrochloric acid reacts with iron filings. Question 6. Compounds such as alcohols and glucose also contain hydrogen but are not categorised as acids. Describe an Activity to prove it. First of all we take solutions of glucose, alcohol, hydrochloric acid, sulphuric acid, etc.Then fix two nails on a cork as shown in the figure, and place the cork in a 100 mL beaker. After that Connect the nails to the two terminals of a 6 volt battery through a bulb and a switch, as shown in Figure. Now pour some dilute HCl in the beaker and switch on the current. 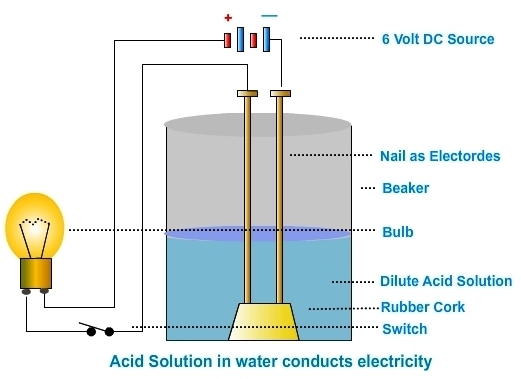 Repeat the same with dilute sulphuric acid.In both the cases, we observe that when we use dilluted acids such as hydrochloric acid or sulphuric acid the bulb glow as they get dissociate into ions which are must for conduction of electricity. Where as, when we repeat the experiment separately with glucose and alcohol solutions, we observe that the bulb does not glow.Which implies that glucose does not disassociate into ion . Therefor, glucose or alcohal is not an acid. Question 7. Why does distilled water not conduct electricity, whereas rain water does? Answer : Distilled water is the purest form of water without any impurities in it. As distilled water does not dissociate into ions therefor it does not conduct electricty. Rain water has dissolved CO2 in it which turns rain water into a dilluted carbonic acid. Due to the presence of carbonic acid it get dissociate into ions. These ions are responsible for electrical conductivity in rain water. Question 8. Why do acids not show acidic behaviour in the absence of water? Answer :In absence of water, acids do not dissociate. So, they do not show acidic behaviour. Arrange the pH in increasing order of hydrogen-ion concentration. C (11) < E (9) < D (7) < A (4) < B (1). Question 10. Equal lengths of magnesium ribbons are taken in test tubes A and B. Hydrochloric acid (HCl) is added to test tube A, while acetic acid (CH3COOH) is added to test tube B. Amount and concentration taken for both the acids are same. In which test tube will the fizzing occur more vigorously and why? Answer : In test tube A, fizzing occur more vigorously because HCI is a strong acid reacts more vigorously with Magnesium in test tube A than Acetic Acid in test tube B hence dissociate more with fizzing . Question 11. Fresh milk has a pH of 6. How do you think the pH will change as it turns into curd? Explain your answer. Answer :Acidic substance are sour in taste. When fresh milk with pH value of 6, turns into Curd it gets sour implying that it has acquired acidic characteristic.This increases acidity will result in lowering its pH value from 6 to some lesser value. On 0 to 14 pH scale, 1 is strongly acidic, 7 is neutral and 14 is strongly alkaline. Question 12. A milkman adds a very small amount of baking soda to fresh milk. (a) Why does he shift the pH of the fresh milk from 6 to slightly alkaline? (b) Why does this milk take a long time to set as curd? (a) A milkman adds a very small amount of baking soda to fresh milk. by doing this, he shifts the pH of the fresh milk from 6 to some higher value i.e. slightly more alkaline. A slightly alkaline milk takes longer time for setting into curd. (b) As we know Curd is acidic in nature so it pH value will be lower than fresh milk with pH value 6. Here by adding baking soda we have raised its pH value above 7, there for it takes more time to come down from raised level of pH value to lower pH value when milks start turning into curd due to increased acidity below pH level of 7. Question 13. Plaster of Paris should be stored in a moisture-proof container. Explain why? Answer :Plaster of Paris easily absorbs water and forms hard gypsum. Thus, if Plaster of Paris is not kept in in a moisture-proof container, then all Plaster of Paris will get converted into gypsum. Question 14. What is a neutralisation reaction? Give two examples. Example (ii) Ca(OH)2(aq) + H2SO4(aq) → CaSO4 + H2O. Question 15. Give two important uses of washing soda and baking soda. (i) Sodium carbonate (washing soda) is used in glass soap and paper industries. (ii) It is used in the manufacture of sodium compound such as borax. (i) Sodium hydrogencarbonate is also an ingredient in antacids. Being alkaline, it neutralises excess acid in the stomach and provides relief. (ii) It is also usen in soda-acid fire extinguishers. Acid-base indicators are dyes or mixtures of dyes which are used to indicate the presence of acids and bases. Acidic nature of a substance is due to the formation of H+(aq) ions in solution. Formation of OH–(aq) ions in solution is responsible for the basic nature of a substance. When an acid reacts with a metal, hydrogen gas is evolved and a corresponding salt is formed. When a base reacts with a metal, along with the evolution of hydrogen gas a salt is formed which has a negative ion composed of the metal and oxygen. When an acid reacts with a metal carbonate or metal hydrogencarbonate, it gives the corresponding salt, carbon dioxide gas and water. 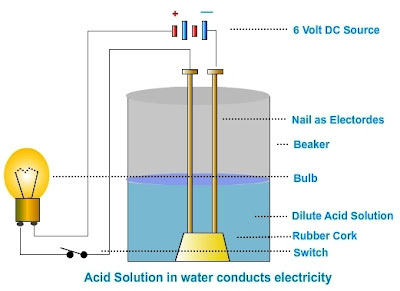 Acidic and basic solutions in water conduct electricity because they produce hydrogen and hydroxide ions respectively. The strength of an acid or an alkali can be tested by using a scale called the pH scale (0-14) which gives the measure of hydrogen ion concentration in a solution. A neutral solution has a pH of exactly 7, while an acidic solution has a pH less than 7 and a basic solution a pH more than 7. Living beings carry out their metabolic activities within an optimal pH range. Mixing concentrated acids or bases with water is a highly exothermic process. Acids and bases neutralise each other to form corresponding salts and water. Water of crystallisation is the fixed number of water molecules chemically attached to each formula unit of a salt in its crystalline form. Salts have various uses in everyday life and in industries.